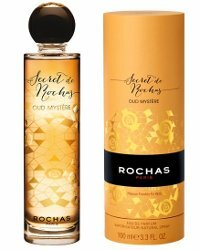 Rochas has launched Secret de Rochas Oud Mystère, a new fragrance for women. Secret de Rochas Oud Mystère is a flanker to 2013's Secret de Rochas. Secret de Rochas Oud Mystère was developed by house perfumer Jean-Michel Duriez. The notes include saffron, rose, gardenia, oud, spices, patchouli, frankincense and woods. Rochas Secret de Rochas Oud Mystère is available now in Dubai, in 100 ml Eau de Parfum. Another flanker, & more oud – we should be grateful for the small mercy that it’s not a celeb production…! Oud Radiance or Circus Oud perhaps. Love the simple bottle. I’ll be looking to try this one, I’m always on the hunt for a wearable oud, some of them go decidedly three-day-old-dead-gerbil-in-a-sweat-sock on me. The bottle is gorgeous, & love the carton too. No idea if it will be widely distributed or not. This is rather thrilling: a double flanker! Not only to Secret, but also to Mystére. Yeah — I thought of that and couldn’t decide. Maybe it is. I know, a dual flanker seems like too much to hope for, right? And yet, Mystére was the most iconic Rochas, other than Femme. If it were any other brand, it would be just another meaningless adjective, but from Rochas, it cannot be a coincidence. Even after making allowances for the reptilian marketing brain. I’m sort of afraid of what might happen if this were to become a trend, though. Frankenstein marketing!